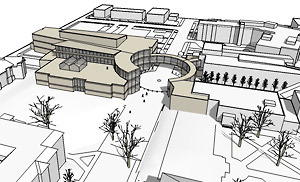 On March 20, Augsburg's Board of Regents received an update on the planning for the newest addition to campus -- the Center for Science, Business, and Religion. This new interdisciplinary building will serve as a home for these departments and others while reshaping how the campus intersects. After holding a series of meetings with approximately 300 members of the Augsburg community, the Building Project Steering Committee has worked with architectural firms to create several plans that it presented to the Regents. These design schemes include a building plan, a landscape architecture plan, and an updated campus master plan. Since the new Center will replace Science Hall, it creates an opportunity for rethinking the quadrangle. One of the key design concepts that emerged during this process is that of a pedestrian- and green-space-friendly extended quadrangle. When combined with the existing area of Murphy Park, the extended quad will make for a natural pedestrian area running from the Kennedy Center all the way to Luther Hall. Another concept that the Committee has focused on is how the new Center will intersect with the rest of campus and our surrounding neighborhoods. Skyways to both the Lindell Library and Sverdrup Hall are being considered. Also, since 21st Avenue S. will end in a left-turn cul-de-sac behind the new Center, the Committee is looking at ways to make this north entrance to campus appear physically welcoming to our visitors and neighbors. The Committee has been working on these plans since January, and its members will present a comprehensive proposal to the Regents in early May. They will be seeking further input from the community during April 7 - 14. Please check the Daily A-Mail and watch for other announcements about when and where the Committee will be collecting feedback.